The Portland Winterhawks play their only home game in a 22-day stretch at 7 p.m. Friday when Spokane visits Memorial Coliseum. The Hawks have won four of their last five games but trail first-place Everett by eight points in the U.S. Division standings with eight regular-season games remaining. Portland is not likely to catch Everett for the division and conference title, but the focus for Hawks coach Mike Johnston and his staff is to enter the playoffs — three weeks away — healthy and playing well. Brendan De Jong (lower body injury) is practicing, though as of Monday Johnston did not have a firm return date for the 20-year-old defenseman. Defenseman Matthew Quigley (upper body) remains out for at least a couple more weeks, according to Johnston. Johnston said he is pleased with the way younger D-men have responded to added playing time and are gaining experience that could pay off down the road. The recent play of goalie Shane Farkas also is an encouraging sign. 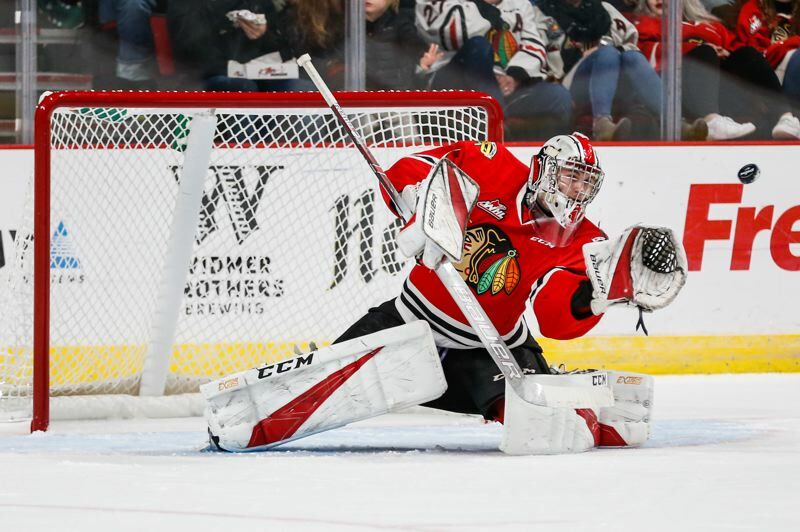 Last Saturday at Seattle, the 19-year-old came off the bench after Portland fell behind 3-0 in the first period and stopped every shot the rest of the way as the Hawks rallied for a 4-3 shootout victory. Farkas has allowed no more than one goal in four of his last five appearances, the exception three goals in a Feb. 18 game at Vancouver the Hawks won 5-3 in one of their better recent performances overall. Johnston pointed to competition with Joel Hofer, plus extra rest and practice time since Hofer joined the team, for contributing to the strong play from Farkas. Hofer was the Western Hockey League and Canadian Hockey League goaltender of the week for Feb. 11-18, so it appears the Hawks have two hot goalies. n The only Winterhawks loss in the last five games was Friday's at Tri-City. The 4-2 defeat, sealed with an empty-net goal, means Portland won only one of its eight games against the Americans this season. All eight went down to the wire, with Tri-City prevailing three times in overtime and once in a shootout. Tri-City's top two lines and the play of goalie Beck Warm made the games very competitive, said Johnston, adding that Warm is under-appreciated. Barring an unlikely twist, the Hawks will face Tri-City or Spokane in the first playoff round. Those rivals were tied for third place with 69 points through last weekend. If Portland finishes second in the division, it will face the third-place team in the first round. Tri-City would have gotten stronger had the Detroit Red Wings decided to send 19-year-old forward Michael Rasmuseen back to the WHL. But the deadline for that decision was Monday, and Rasmussen is staying with the NHL club, which is near the bottom of the Eastern Conference and looking to the future. In 51 games of his first NHL season, Rasmussen has seven goals and eight assists. To be eligible to join Detroit's American Hockey League affiliate for those playoffs, because he's 19, Rasmussen had to return to the Americans for the remainder of this WHL season, including the playoffs.